When I say mini, I mean the whole experience is rather BIG on that point, if you’ll pardon the expression. The bag is small, though not too much so. If you’re looking for a snack that you and one or two friends could polish off, this is definitely the thing to do. If you’re looking for a snack that will keep you compamy while you watch your favorite show… this could also do the trick. If you’re looking for something you can go back to a few times… find something else. On a solo journey, the bag could last two sittings tops. Three if you’re watching your figure. Why? Because these dips are also rather small. They are literally bite sized, though slightly larger than Mini Oreos. The chocolate comes straight from Hershey, according to the packaging, which is always welcome., though while the packaging boasts “Made with real peanut butter”, wouldn’t it be charming if it was Reese’s peanut butter (also owned by Hershey)? Alas, that point is never made clear on the bag. For those who are fans of the Take 5 candy bar, the experience won’t be altogether unfamiliar. Missing only the actualy peanuts and caramel, the mini dips are very reminiscent of the Hershey Take 5 bar, and I mean that in the nicest way. Capturing the perfect combination of salty and sweet in a surprising filling package, the Peanut Butter Pretzel Sandwich Dips do an excellent job of satisfying your sweet tooth. 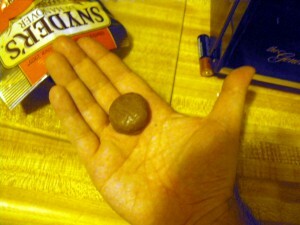 The peanut butter remains creamy, losing the solid state that many prepackaged peanut butter snacks fall into (where the peanut butter is drier and almost flaky instead of spreadable — see Resse’s Peanut Butter Cups that have been around too long.) The weakest part of the experience is also a relatively strong suit for the snack overall, and that is the chocolate coating. It melts easily (reminding you of the proudest quality of M&M’s). But while the chocolate will MOST ASSUREDLY melting in your hands as well as your mouth, it does leave one with a slightly fresher flavor which could have been stifiled by some sort of sealant. The pretzels remain crisp and tasty and DO NOT lose the salt which makes the snack that much tastier. 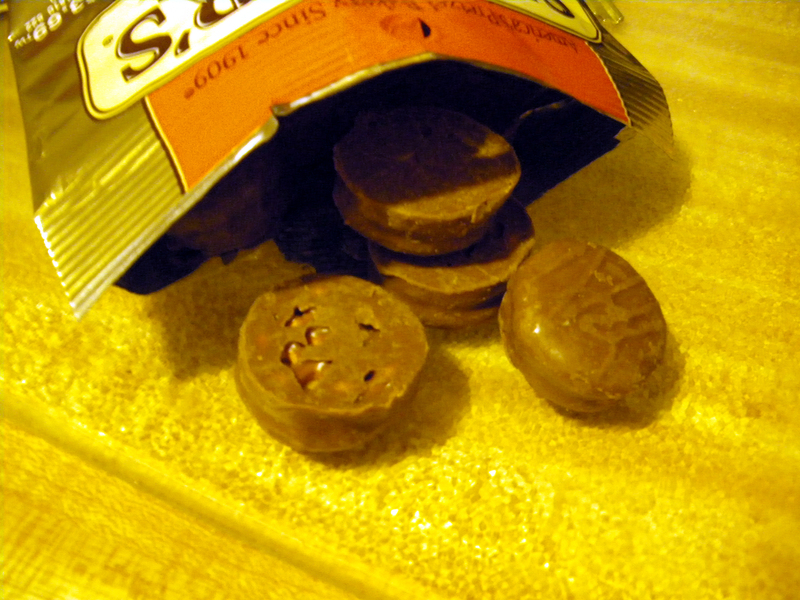 I once bought store-made chocolate covered pretzels where the owners chose to leave out the salt from the pretzels. Those snacks were left very dry and quite unworthy of a repeat performance. The Peanut Butter Pretzel Sandwich Dips delivered everywhere it counts. If you’re a fan of salty and sweet and a fan of chocolate and peanut butter, I wouldn’t pass these up. Though if you’re planning on entertaining a larger group, you may have to buy a few bags more. I was recently trying to think of the first real sweet & salty food experience I’d had and you just reminded me! It was definitely Take 5. 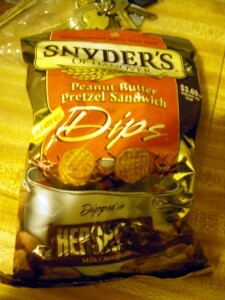 These pretzel things look yummy… glad they kept the salt. It’s crucial. Great information, I just bookmarked this.